At some point, every priest is asked to conduct numerous services for people he didn’t know. Someone that the parish has never met, seen, or heard of. It happens to all clergy. This is an opportunity not to be squandered by not knowing what to do, or how to do it. The Lord did not squander opportunities, neither should we. That someone would make such a request tends to generate assumptions in us. The deceased must have been unconverted, or unchurched, or estranged from a church. Why would they even bother with a church funeral? Do they think this will make up for a life lived without Christ? Put aside these thoughts. The reality is, you don’t know, and you have work to do. 1. Be happy to conduct the service. See it for what it is, a chance to do real ministry to people who aren’t expecting it. Chances are they will expect to be harshly judged, and a little defensive. You can allay those fears with gentle cheer, willingness to serve, and professional demeanor. These days, families really do Google searches for ‘clergy who will do a funeral for someone they don’t know’. This is shameful! Of course we will bury them, and conduct the appropriate service according to the Tradition of the Church. 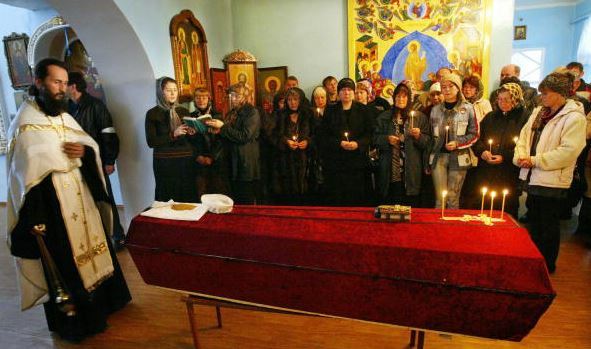 Most of the time, it was the wish of the deceased to be buried in and by the Church. Since we often know little else, for certain, we have a job to do. 2. Don’t jump to conclusions. Initial assumptions about the deceased as godless, anti-church, an unbeliever (possibly baptized as a child, but that was the last time they darkened the door of the Church) or neglectful of their spiritual life as someone who had nothing to do with Christ may be dead wrong. This is a child of God we are about to put in the ground. We need not cast judgment, because we just do not know. We don’t know their struggles, what they encountered during their life, and how they reacted to the grace given them. We just don’t know how we ended up where we are. Avoid judgment, and don’t jump to conclusions. You could be burying someone of exceptional love and faith who had no way to get to the church for a long time. Seems obvious, but in reality it is almost completely ignored in most funeral homilies! Protestant funerals, if they even offer funerals any more (preferring cremation and memorial services where the ‘d’ word (dead) is never uttered), tend to focus on decisions for Christ, conversions, and other ‘make your choice now’ moments, complete with altar calls. Some focus on the life of the deceased, or their faith (not a bad thing, see #4 below), but ultimately leave out the most important part of the Gospel – the Resurrection of Christ. ONLY the Resurrection gives hope to mortal man. You are seeing people at a funeral service you will never see again, some of whom will not darken the door of a church again, until they are dead themselves (if then!). Preach the Resurrection. 4. Say with integrity, if you can, what you can about the deceased. Take time to find out whatever you can about the deceased. Mention something good they valued, good deeds, etc. if you know any, but this is not the time to eulogize them, or to allow others to – that is for the wake, not the funeral. It is sufficient to reflect on the shortness of this life, and how important it is to do good while one can, and to decide important things now, not later. It is meet and right to affirm that this person was created in the image of God. To be honest, this is about all you should say about anyone at a funeral, even if you know them well. 5. Do not pretend to know the deceased’s eternal destiny. Our way is the way of prayer, that they may be loosed of their sins, and enter into the bosom of Abraham, life with the blessed. Praying thus is comforting, too. 6. Point to comfort in the Resurrection. Encourage the grieving. Those without the Resurrection have no hope, those remaining do if they look to Christ. Help the audience to see the massive ramifications of the Gospel believed, reminding them not to grieve as those who have no hope, but that they can take comfort in the Resurrection of Christ, and his promises to his believers. The Resurrection is our ONLY hope when we are facing mortality. Leave them with hope. While recognizing the brevity of a funeral sermon (15 to 20 minutes), don’t let them depart without hearing the consolation of Christ. Let them leave with deep understanding of Christ as the hope of all sinners. 7. Grieve with loved ones at their loss. Preparing well for the funerals of unknowns is vital so that those who listen might find some consolation in Christ. Often, preachers see these funerals as a mere duty every clergyman simply must do. Put yourself in the place of the family and friends attending the memorial service. Show it by your concern, your prayers, your calls, and your follow-up conversations. People are often in a haze, and everything can feel surreal. Connecting with them can bring them some much needed clarity, and real comfort. They will only very rarely remember what you said, but they will always remember that you were there to say it. Remember this – in any circumstance – at about 10-14 days, the reality of the death of a loved one really hits hard. The sudden activity and rush of planning is over. The burial is complete. The meals are over. The Sympathy cards have all be read a few times over, and life is now returning to an awful new ‘normal’ that is abnormal in every way to the grieving. This is about the time we normally would celebrate the 9th day Service for the Departed Soul/panikhida. Reach out again to the family at this time, invite them to a ‘short memorial service’ (panikhida) for the deceased. This gives them something to do, and gathers what family members can attend back to the Church to pray for the deceased together. Psychologically and socially it is very healthy, and will help keep the pall of despairing away from these beloved children of God. Before they leave invite them back for the 40th day memorial also. The funeral provides absolutely unique opportunities to speak real comfort to people who are almost all suffering at that moment. Do not squander this opportunity. Multitudes live without hope in Christ. But at a funeral you have a unique opportunity to set forth the one hope that lifts despairing people—Jesus Christ as revealed in the Gospel. While recognizing the brevity of a funeral sermon (15 to 20 minutes), give them Christ. Let them leave with a sense that Christ is the hope of all sinners. Point out that we pray for the repose of the souls of the dead. Point out that we do good deeds in their name as a way of bringing down grace upon them, and upon us. Point out that we have good reason for our hope because of the Resurrection. It is what makes Christianity absolutely unique and so powerful. Do not squander this time. Make it as comforting in its Paschal understanding as possible.